Bucktail Whole - Quality whole Bucktails from Veniard, which have a huge variety of uses and is the standard winging material for large Streamers, Salmon and Saltwater. A medium to coarse hair of approx.100-125 mm in length. Note: These are not a colour extracted Bucktail, but they have been expertly tanned and dyed to eliminate oil and unpleasant smells. 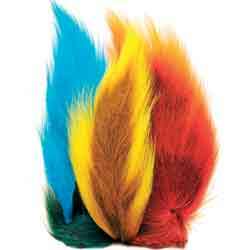 They are a natural product dyed, and therefore the central part of the Bucktail will be darker than the external fur. The Natural White Bucktail is what is says, natural so whole Bucktail is not 100% white, again the middle will be natural brown. Bucktail available in natural and dyed colours. I was getting low on bucktail so your offer was well timed. I am very pleased with the quality. It is better than my existing bucktail. Great product. Great Service. Many thanks.